The family returned to India in the seventh month of their pregnancy, and Shreya rushed to Goa because she missed home too much. This time around, though, Shreya went into labour in the 38th week of pregnancy, and like her first delivery, was admitted in the night, and gave birth to her baby girl, Shravani, at 2.31 a.m. on the morning of January 21, 2016. While for her first delivery, Shashank wasn’t allowed in the labour room, the second time around, he held her hand as she brought their daughter into this world. “By the end of my delivery, which lasted a quick five minutes, I was exhausted but happy that I had made it through everything with no stitches, no tears and no drugs,” she says with pride. 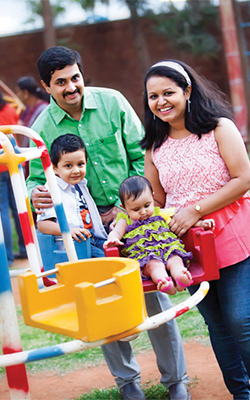 After Sharvani was born, Shreya and Shashank returned home to try and be a normal family again. However, life had other things in store for them and the couple met with a few bumps along the way. “Shaunak began to act up because he was no longer the center of my attention, and he saw me spending most of my time with Sharvani. He treated his baby sister like an outsider and refused to cooperate,” she recalls. However, as time passed by, Shaunak took to his role of ‘Big Brother’ with great pride. “Now, he plays with her, tells her things like ‘don’t cry, mommy is coming’. When he thinks I’m not looking, he tells his friends that he has a pretty sister. Lately, he’s also begun demanding for family hugs! He even says the cutest things like ‘We four are a family’,” exclaims Shreya, basking in the glow of motherhood. 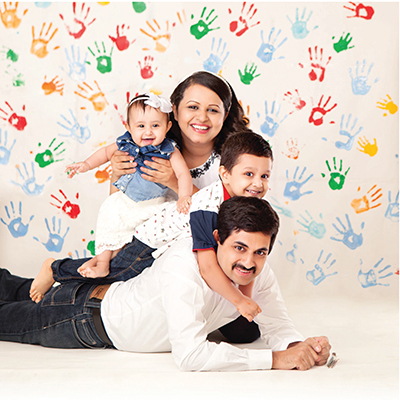 “Shashank and I are completely blessed to have the family we do. Like all parents, we too have big dreams for our two wonderful kids, and hope to give them the opportunities to be great. We want them to be humanitarians first; to be sensible towards society, the environment and towards their friends and family. We want them to enjoy learning, value knowledge and stay curious,” she says. 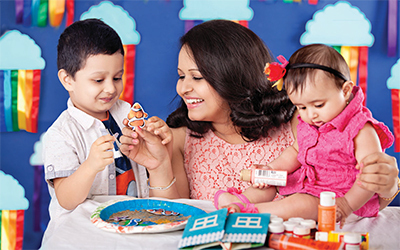 After Shreya became a mother, she wanted to give her children all the love, care and time she could. This meant quitting her job. “I wanted to watch my babies grow up, and be there for all their special moments. With Sharvani, things were a little easier because I knew my way around. However, with Shaunak, I did dedicate my time for the first six months to be at his every beck and call, but I simultaneously did paintings, crafted a few home decor products, which won competitions. By the time Shaunak was eight months old, I felt like my life was missing something. That I needed a purpose. I didn’t want to go back to work full time and miss Shaunak’s growing and learning years. That’s when Shashank encouraged me to go out on my own and start a small business. I had never thought I would turn an entrepreneur in life, but as the saying goes, never say never! That’s when I started my own design firm— Shreya Design Studio, and haven’t looked back since.” she says with pride. “My life has completely changed in every sense. Thanks to my kids, I have learnt the importance of living in the moment. I thank them every day for making me the woman I am today. They are my motivation to work harder and accomplish my goals,” she says.